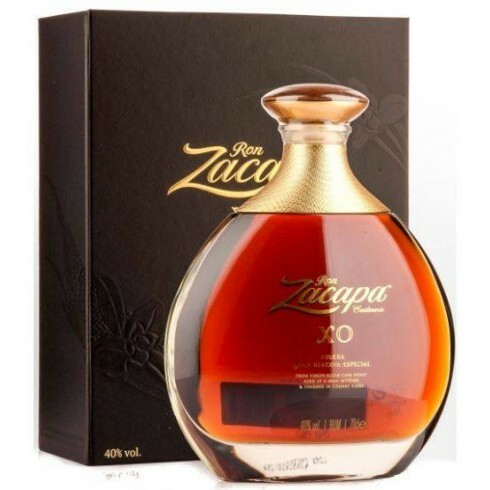 Ron Zacapa XO Solera Gran Reserva Especial – On Offer | Saporidoc UK. XO Solera Gran Reserva Especial from World famous Rum producer Ron Zacapa, for whom rum production is a work of art, and an expression of patience, richness, quality and master blending. Aged to perfection in the highlands of Quetzaltenango in Guatamala, Zacapa Rum develops its complex flavour and character 2,300 m above sea level in the mystical House Above the Clouds. Bouquet A great balance of mature toasted oak, burnt caramel, dry-roasted nuts, marzipan and orange peel; a delicate floral note of honeysuckle in the background. Taste Complex and satisfying balance of sweetness, long, smooth and sweet with a weight of dark cherry chocolate and flavours of intense dried fruits like sultana, date and prune; sweet oak spices of clove, vanilla and cinnamon. Pairs with Best enjoyed on a single large lump of pure, clear ice in a luxury rocks glass with a heavy base. Ron Zacapa XO contains a blend of rums from 6 to 25 years old, with an extra ageing stage in French oak barrels that previously held cognac.